EXPERIENCE THE WORLD’S ONLY ORCA PRESERVE – NORTHERN VANCOUVER ISLAND BC CANADA – FROM NEW ECO-CAMP! Why this trip: The best chances of close views of orcas from the newly eco-improved “glamping” basecamp in the HEART of the first and only orca preserve in the world; the best single time and place in the world to paddle with salmon-eating orcas; sheltered waters and base camp perfect for novice paddlers/whale watching buffs; orcas guaranteed each August – or get a free orca watching day cruise! TELEGRAPH COVE, BRITISH COLUMBIA, CANADA — Sea Kayak Adventures invites outdoor-minded whale enthusiasts to experience their newly eco-improved fully catered/guided basecamp novice paddling trips July-Sept 2013 in the heart of orca territory in BC’s northern Inside Passage, near northern Vancouver Island. The location doesn’t get any better. Perched right on the heart of the sheltered “orca loop” in Johnstone Strait, the company’s exclusive basecamp site is graced with regular killer whale visits during the summer months, as they herd salmon into the cove. The unique smooth pebble beach even offers an ideal “massage” for the orcas who enjoy rubbing their bellies at this spot. This amazing orca immersion, coupled with newly constructed wall tents and sleeping cots, and the culinary and “glamping” flourishes of all SKA tours means eco-touring at its best. Participants will paddle two-person sea kayaks along the shore of northern Vancouver Island, enjoying this glacier-carved waterway between Vancouver Island and the rugged mountains of mainland British Columbia. Along the way, they’ll get close to wild orcas, as well as seeing them from the eco-camp. Guides scan the calm waters for spouts and point out whale behavior. Salmon leap and bald eagles dot the towering trees along the shore, feasting as do the orcas on the prolific salmon runs here. The group will also explore the area’s rainforest on foot, visit the ancient First Nations sites, visit orca researchers and hopefully glimpse a black bear from their kayaks. Each night, after a wonderful beachside happy hour, bountiful dinner and legends and nature talks given by our naturalist guides, happy guests can even watch orcas from their tents. Normally trips depart from Port McNeill on Vancouver Island BC Canada – weekly July through mid Sept (four days paddling/three nights at eco-camp; USD $1195/person). The prices includes camping and kayaking equipment, meals, kayaking instruction and guide services. Youth get 10% of the above prices. HST tax and airfare not included. All About Travel is working with Barbara Babcock (barbara58babcock@hotmail.com) of SAVE OUR VETERANS to send 100 of Oklahoma’s Iraq/Afghanistan Vets to the National Welcome Home the Heroes Parade which takes place in Chicago, December 15, 2012. 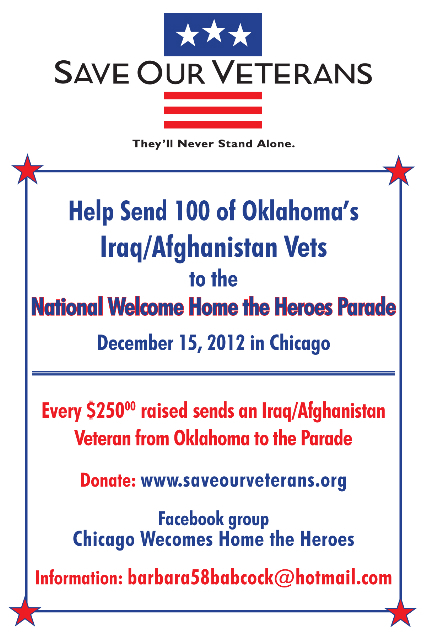 You can help send a Vet to the parade!!! The metro in Amsterdam – current & planned (2017) situation. Do you ever feel like you’ve got to leave your mark behind on this earth? That you can’t just live your life and leave without leaving something positive behind? By making some kind of difference in the world? NEW Trip: Baja Blue & Gray Whale Extravaganza! New Trip Announced – Baja Blue and Whale Combo 2013 – Whales Guaranteed! Trip: Safari-style basecamp whale watching in Baja’s Magdalena Bay combined with lodge-based blue whale touring in Loreto Bay – whales guaranteed Feb-mid March! Why this trip: Affordable soft adventure travel (this is not a kayak tour), guaranteed eyeball to eyeball gray whale sightings, chance to touch a gray whale, exclusive beach base camp in prime gray whale calving lagoon; combined with chance to snorkel and whale watch (blue and fin whales) in Sea of Cortez UNESCO World Heritage site, near Loreto, Baja California. LORETO, BAJA CALIFORNIA — Being up close and personal with a gentle gray whale is something everyone should experience at least once in their life. Sea Kayak Adventures offers one of the best opportunities for this type of soul-rejuvenating and inspiring adventure. Magdalena Bay is federally protected by the Mexican government as a winter sanctuary for the California gray whale, where the whales give birth, nurture their calves and mate. The company has a novel offering – combining this special tour with a Loreto Bay snorkeling and whale tour in the Sea of Cortez. Both a national marine park and UNESCO World Heritage site, one can often see blue whales (the largest creature on the planet) and the slightly smaller fin whale. Sea Kayak Adventures’ Isla Santo Domingo “safari-style” base camp is located right in the heart of the largest gray whale calving area in Magdalena Bay (Pacific side of the Baja peninsula), where we can see whales right from our camp. However, this adventure offers much more than simply seeing whales. On Sea Kayak Adventures’ whale watching tours, from six-man motorboats, participants have a chance to actually touch one of the 20,000 gray whales that winter in the waters of Baja California’s Pacific coast each February and March. It is hard to believe that in the 1950’s these gray whales were near extinction due to whaling. After the gray whale excursion, participants will go snorkeling and whale watching in Loreto Bay National Marine Park/UNESCO World Heritage site, based out of our downtown Loreto tour hotel. Here they will have a chance to travel alongside a massive blue whale – the largest creature on the planet, and/or it’s slightly smaller cousin, the fin whale, and even pods of curious dolphins. Guides versed in whale natural history lead fun activities for participants, point out all wildlife, including leading birding excursions by demand, and prepare all meals in our huge camp kitchen. Whale guarantee – gray whales guaranteed Febrary 5 through March 10 – if none seen, the company will give participants a free day tour whale watching. Tour participants will arrive on a Sunday and depart on a Sunday; with four nights’ hotel (with pool) accommodation in Loreto, daily whale watching by motorboat, all camping gear, naturalist guides, meals at camp, taxes, arrival airport transfer. This is not a kayak tour; novices are welcome. Airfare to Loreto in southern Baja California, Mexico, meals in town, national park fee are not included. Feb & March 2013 dates include air arrival and departure days. Cost: $1495 US for this eight-day tours (10% off for youth 17 and under). Alaska/Horizon airlines now fly into Loreto LTO from Los Angeles LAX five times a week.